Grindr is to the gay, bi, trans, and queer dating world what Tinder is to the straight-dating world. However, one major difference exists. In most countries, Tinder works well and even though it’s blocked in a handful of nations it’s mostly accessible. Grindr, on the other hand, is blocked more widely. If you’re looking to meet someone new on the app then you’ll likely be in for some disappointment when you find it blocked. You could be travelling to a new country when you find Grindr blocked or you may live there, but whatever the reason the good news is there is a really simple way to unblock it. Unblocking Grindr in the country you’re in either if you live there or are travelling there is easy. The same if you want to unblock it on your work network or another network where you find Grindr inaccessible. For this, you’ll need an additional app to make Grindr work. The app is called a ‘VPN‘ and it allows you to disguise what you’re doing on the internet. They work with either mobile internet (the one you access via a sim card) or regular internet (the kind you would find in your home, or Wi-Fi in a hotel). 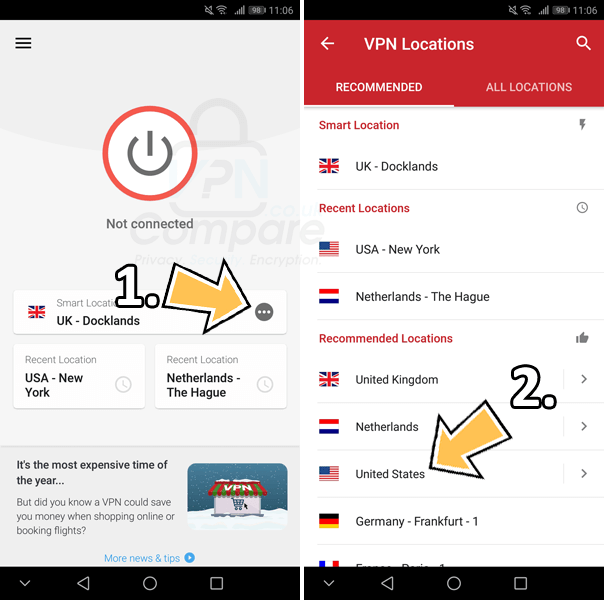 There are loads of VPN apps to choose from. I recommend using ExpressVPN as they’re one of the best. They also come with a 30-day money back guarantee allowing you to test it with Grindr and see it working without risking your money. There are a few others that will be suitable for unblocking Grindr like IPVanish, CyberGhost VPN and NordVPN so if you’ve got time take a look at those too. Although they all do the same job. Using a VPN is easy. You first need to select one from above. My recommendation is ExpressVPN. Then follow these 5 simple steps to unblock Grindr in your country. Then download their app from your app store. Open the app and enter your login details. Press ‘Choose Location‘ and then select a country outside your own (2). Wait for the app to connect. Once the ExpressVPN app has connected you can open the Grindr app. Instead of being blocked and it not working like before, you’ll now be able to swipe left or right until your heart is content. A VPN works by disguising what you’re doing on the internet. This is how it unblocks Grindr. You’ll need to use the VPN to connect to a nearby country if Grindr is blocked in your country. For example, if you’re in Indonesia then connect to Thailand or another nearby country where Grindr works. The VPN app then sends all of your data through that country. While it’s travelling from you to the country outside of your own it’s impossible for anyone to read it. At the very most, all anyone would be able to tell is you’re using a VPN. As they can be used for 1000’s of different purposes from unblocking American Netflix to bypassing censorship that doesn’t tell you much. Your internet company won’t know what you’re accessing because the VPN app ‘encrypts’ your internet connection. This means it’s unreadable to anyone else and is how it allows you to access Grindr safely. Of course, it’s worth remembering that a VPN can’t protect any personal details that are made publicly available via the Grindr app. So if you’re uploading your photo then that becomes publicly viewable and you should exercise caution especially if you live in a country where being gay, bi, trans or queer is forbidden or frowned upon. You may find that it’s impossible to even download Grindr in the first place and could find it removed or blocked on your app store. If you’ve got an Android device then you’ll need to download the Grindr app outside of your app store. You can download it from APK Pure here. Simply visit the link on your mobile device to download and install directly. If you’ve got an Apple iPhone or iPad then the process takes a few more steps and for this you should follow this guide to get the Grindr app downloaded to your Apple device. If you’re itching to hook up with that new special someone but Grindr is blocked in your country or on your network, don’t panic. By using a little app called a ‘VPN’ from ExpressVPN you can unblock Grindr anywhere and get swiping right (or left) within minutes. Sign up for ExpressVPN and download their app. Then connect to a country outside your own. For example, if you’re in Indonesia connect to Thailand or if you’re in Turkey connect to Cyprus. Now open the Grindr app and you’ll find instead of being blocked you can get on with browsing profiles right away. It would be great to know where you’re unblocking Grindr from. Why not pop a comment in the section below to let us know.